Applications: The most important application for these discs is in the removal and blending of TIG welds on stainless steel fabrications. As part of a process with Trizact 237 grip discs, stainless steel welds can be removed and polished out. The grip backing makes it quick to change discs to move from these ceramic abrasive discs to the follow-on stages in the process. Whilst these discs can be used under light pressure on fixed speed angle grinders, it is easier to achieve neater results using a slower, variable speed machine such as FiniPower, with higher pressure being applied. Product Notes: These discs are the replacement for the Cibo 777 grip discs with very similar performance, but at lower prices. FX87 material uses a high quality ceramic grain on a durable polyester backing to which 'velcro' type grip backing is applied. 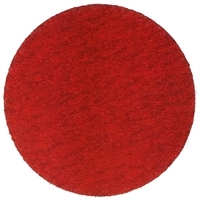 The abrasive is top coated to aid grinding whilst reducing heat. The discs shown as '115 + 75mm' or '125 + 75mm' have press-out centres enabling further life to be draw from the 75mm centres, which will tend to be less worn than the periphery of the discs. Also Available: We recommend 'VEL' type backing pads used with an interliner, espacially when working on flat surfaces. We also stock a full range of Trizact and unitised grip discs as part of the metal polishing process.